No, it’s not your imagination! Some people really are insect magnets. According to researchers, there are several factors that may contribute to the attraction. One factor is blood type. People with type O blood attract gnats, mosquitos, and other annoying insects far more than people with other blood types. So if you are one of these unlucky folks, what to do? 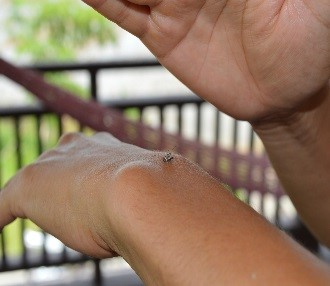 One of the most effective approaches is applying an insect repellant to your skin and/or clothing. There are many readily available options at most stores where personal care products are sold. Incorporating some plants into your landscape that are natural insect repellants such as lemon balm, rosemary, and lavender also can help reduce the pest population around your home. While plants alone can’t make your yard pest free, they can help fend off some of the aggravators. Plus, many of these plants add wonderful aroma and color to your yard. Another important strategy is tackling the potential for standing water around your home. Take a quick walk around your yard and remove any containers or other items that could hold rainwater. For features in your yard that you cannot or don’t want to change, such as a pond or bird bath, adding mosquito dunks on a monthly basis will kill mosquito larvae. You can pick up a free mosquito dunk kit at the Birmingham Courthouse Room B-210, Bessemer Justice Center, or Center Point and Hoover satellites. 1. Decide what you want to grow, and do a little research to determine if the amount of sun your chosen space receives will be right for your ‘crop’ choices. 2. Select the right sized container for your plant choices. Some plants like squash and vining tomatoes need a deep container because their root zones require as much as 30” of growing medium while others like leaf lettuce and scallions can thrive with just 4”. 3. 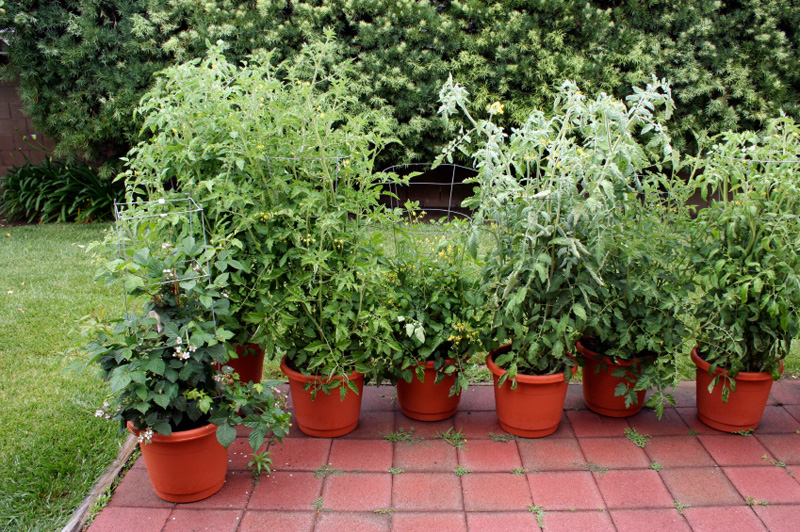 Use a commercial soilless mix specifically designed for container gardening. These mixes are lighter in weight, drain better than regular garden soil, and often contain materials that help retain moisture. 4. If the growing medium you have chosen does not contain a fertilizer, add a slow release organic fertilizer according to package directions. 5. Make sure that you keep your container garden well-watered, according to the needs of the plants you are growing. Some container grown plants can require watering two or three times each week. There are many websites and publications available to provide you with more information about successful container gardening. The Alabama Cooperative Extension System publication Container Gardening, available at aces.edu or 879.6964, is a great place to start! Brown Bag Lunch & Learn Seminar Series – Birmingham Botanical Gardens – This series of FREE seminars starting in May and running through October offers fresh, practical ideas and techniques for your landscape and garden. No reservations are required; light refreshments provided. Visit bbgardens.org or call 414.3950 to learn more. 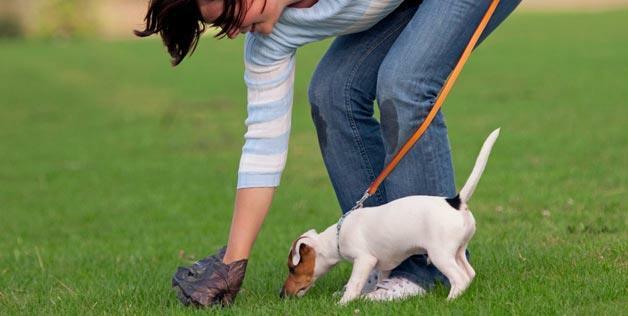 Do Dah Day – May 14 – Rhodes and Caldwell Parks, Birmingham – Jefferson County Storm Water Management staff will be at this fun, family friendly event again this year promoting the proper disposal of pet waste with the ever popular Wholly Cr@p Dog Doo Game. Visit dodahday.org for more information. Spring is here, and with it comes the start of the growing season. Maybe you have plans to reconfigure your landscape, install some new plants, or build a patio or deck in your yard. Since most improvements or changes to the landscape involve some type of land disturbance, it’s important to factor in how to prevent soil from being exposed to the elements while your project is being implemented. Soil and the things that live in it and because of it make up a complex web of interdependency. Without soil, most living things would cease to exist. Wind and rain can leach away valuable nutrients that nourish plants from bare soil. Rain also can erode soil, creating sediment in creeks and streams which kills aquatic wildlife and fills in streambeds, causing flooding. Soil particles attract and bond with yard chemicals, so these chemicals tag along with eroded soil and can end up in local waterways where they harm water quality, aquatic plants, and animals. 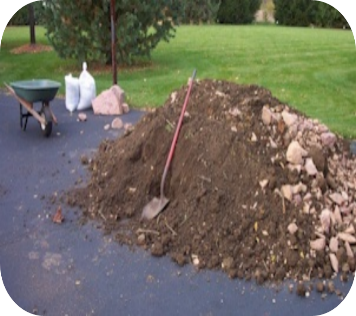 If you have dug up the soil for a small project but can’t complete it right away, you can cover the exposed soil with a tarp and secure the edges, or install a layer of mulch to help hold soil in place until the project can be completed. If you are going to implement a project that involves digging up, filling in, or grading large amounts of soil, you may be required to obtain a land disturbance activity permit and implement some additional BMPs. To find out if the project you are planning to implement within unincorporated Jefferson County requires a permit, call 325-8741. If you live in an incorporated area, contact your municipality to learn about permitting requirements. Brown Bag Lunch & Learn Seminar Series – Birmingham Botanical Gardens – This free series of seminars starting in May and running through October offers fresh and practical ideas and techniques for your landscape and garden. No reservations are required; light refreshments provided. Do Dah Day – May 14 – Rhodes and Caldwell Parks, Birmingham – Go to dodahday.org for information about this fun, family friendly event. Rain Barrel Workshop – June 18 – Learn how to build a rain barrel or purchase one to take home, and start enjoying the benefits that storing and using rainwater can bring. Preregistration required by June 8. Click HERE for more information. Step Away from the Spray! – Stop by Storm Water Management (B-210 Courthouse Annex) to pick up a free mosquito dunk kit which targets mosquito larvae growing in standing water, or invite us to speak at your next community or organization meeting in unincorporated Jefferson County. These biologic dunks target and kill mosquito larvae in standing water, they can’t accidentally kill pollinators like bees or butterflies, and they do not harm people, pets or wildlife. 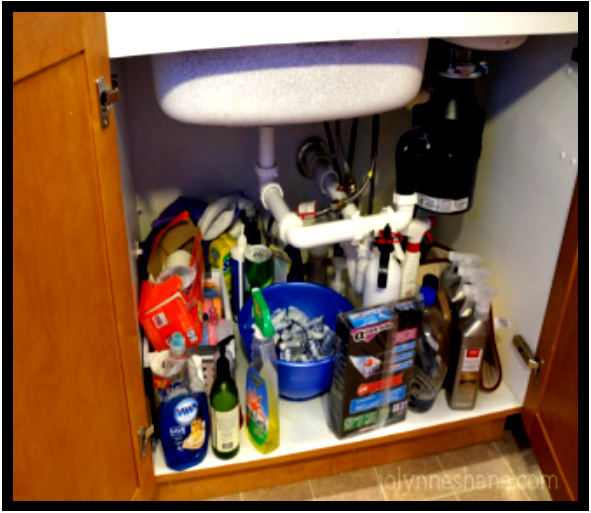 JeffCoH2O: You’ve Got WHAT Under the Sink??? Or maybe it’s that stuff collecting dust in the corner of the garage. You know what we’re talking about: rusting cans of paint (did you really paint the walls that color? ), fertilizer that’s so old it has hardened into a brick, drain cleaner that they don’t even make anymore, unlabeled jars of something you can’t remember saving. Just know that you are not alone! The average American household stores a whopping 100 pounds of household hazardous waste within the home. The problem is that when it’s time to do some spring cleaning, many of these products should not be thrown away in the regular household trash, or may need to be handled in a specific way first. Bringing those items that will be accepted to a Household Hazardous Waste Day event is a great option for proper disposal. But the best long term solution is to carefully plan out what you need to accomplish a task or complete a project, buy the least toxic product available, and only purchase what is needed to get the job done. If you buy a product in a large quantity, be sure that you will be able to use it all over a set period of time. It’s also important to pay attention to how the container should be discarded when it is empty. In some cases, empty containers that contained chemicals such as pesticides should carefully be rinsed and the resulting diluted product properly used before the container is recycled or discarded according to package directions. AL People Against a Littered State (PALS) Spring Cleanup – Want to make a difference in your community? Consider organizing or participating in a volunteer roadside litter cleanup. Last year, 1009 volunteers participated in 35 cleanups, removing 65 tons of litter and trash from roadways in unincorporated Jefferson County. Several of these volunteers received statewide awards for their efforts. Cleanup resources such as flyers, gloves, bags, safety t-shirts, traffic control and trash disposal are available for FREE to unincorporated Jefferson County Communities. Call 325-8741 to learn how your community can participate. Household Hazardous Waste Day – March 19 – McClendon Park, Legion Field – 9 am – 12 noon (or until capacity is met) – It’s estimated that Americans generate an astonishing 530,000 tons of household hazardous waste every year. Now’s the time to root through your garage, peek under the kitchen sink, and gather up items for proper disposal at Household Hazardous Waste Day. FREE and open to all Jefferson County residents. Find out what items will be accepted by visiting facebook.com/JeffersonCountyAL or by calling 325-8741. Updating your home can be an exciting and worthwhile endeavor. When the work is done and you are admiring the results, it’s easy not to give much thought to the impact paint, demoed materials, new construction materials, and the cleanup process might have had on the environment. Paint, solvents, dust, adhesives, and other by-products of construction can wind up in the local stormwater drainage system when left outside uncovered and exposed to rain. With a little research and planning, your home improvement project can have great results as well as be stormwater friendly. Choosing materials with the least overall impact to the environment is an important part of the planning process. Some considerations include the sustainability of the material sources; the energy used in their extraction, manufacture and transportation; their potential health effects; and the disposal options available. For example, low VOC water based paint is the least toxic formulation and requires just soap and water to clean brushes, containers and spills. 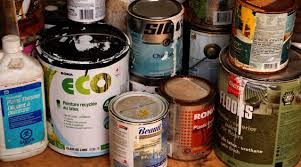 Leftover water based paints can be stored in jars with tight lids for touch-ups, taken to a household hazardous waste day for disposal, or allowed to dry out (adding some clean cat litter can help) and placed in the regular trash. In a renovation, old cabinets, doors, windows, appliances, counter tops, fixtures, and many other materials can be kept intact and donated to a charity for reuse or, if in bad shape, recycled at a location which properly disposes of these items. If you are doing the work yourself, you can save money by looking for ways to repurpose materials by deconstructing rather than demoing them whenever possible. Brick from a fireplace redo can be repurposed as a garden walkway, and old kitchen cabinets can have a second life in the garage as a storage unit. During construction, it’s important for both debris and new materials stored outside to be kept covered to protect them from rain and located away from paved areas to avoid the leaching or washing of materials into the storm drainage system, since some construction materials contain metals or chemicals that must be kept out of waterways. If you plan to hire a contractor for your remodel, be sure to ask if they use products with the least impact to the environment; plan to reduce waste by reusing or salvaging materials and recycling debris; and will properly handle, contain, and dispose of adhesives, solvents, and other construction waste. 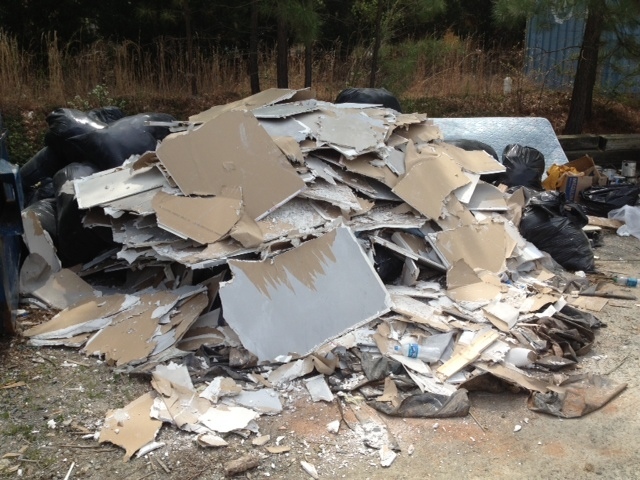 Plan out your next home remolding or DIY project the right way, so that you do not end up with a mess like this! Tree Seedling Giveaway – February 25 – Linn Park – FREE tree seedlings ready for planting 8 am – 3 pm. For more information, call 787-5222. 24th Annual Plant Dig – February 27 – New Georgia Landfill – Dig up FREE plants from 8 am – 1 pm. Call 781-0598 to learn more. A free workshop is offered on February 20 8am -10am at Birmingham Botanical Gardens to learn how to identify and harvest the plants at the plant dig. Visit bbgardens.org for details. Household Hazardous Waste Day – March 19 – Legion Field – McLendon Park – This FREE event is open to all Jefferson County residents 9 am – 12 noon or until capacity is met. Click HERE for a list of items that will be accepted. JeffCo H2O: Blue: It’s the New Green! For years, ‘green’ has been the buzz word for all environmentally friendly practices. But recently, attention has zeroed in on water resources, and with good reason. Environmental and economic experts predict that by 2050, more than half of the world’s population and economy will be located in areas which will experience severe long term water shortages, placing human health, food supplies, and economies at risk. Whether you buy into these predictions or not, the western US recently experienced a drought which already has cost states, businesses and residents billions of dollars. Here in Alabama, we are fortunate to average 54 inches of rain each year, but even we have gone through periods of drought that greatly reduced our water supply and restricted its use. Water quantity isn’t the only issue that we are facing – water quality is an equally important matter. That abundant rainfall we usually experience picks up pollutants from the ground and washes them into rivers, creeks, lakes and streams. In fact, stormwater runoff is the #1 source of pollution in US waterways. Just like water scarcity, the availability of clean fresh water is also a health and economic issue. 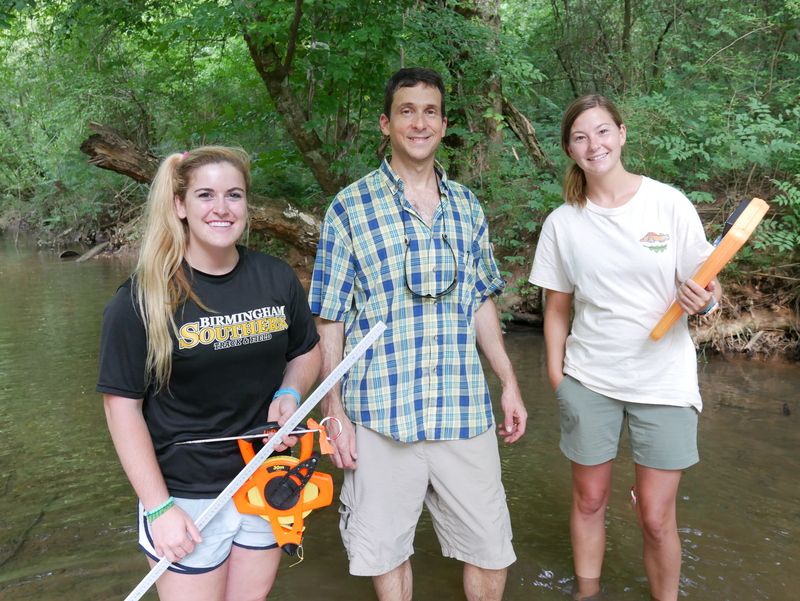 So it really makes sense to implement practices that protect our rivers, creeks, lakes and streams from polluted runoff and other sources of pollution. 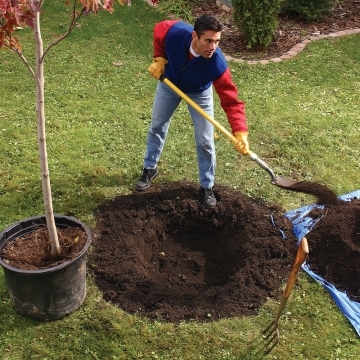 The top two practices to consider are reducing the amount of stormwater that leaves your yard (consider planting a tree, installing a rain barrel, using pavers instead of concrete for walkways) and preventing pollutants from coming in contact with stormwater (like following package directions when using yard chemicals, picking up after your pet, fixing any vehicle drips). 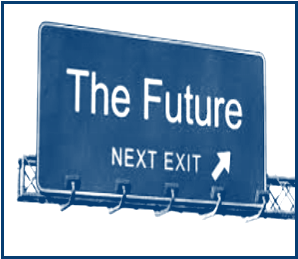 Adopting these and other easy practices can help make our future blue.